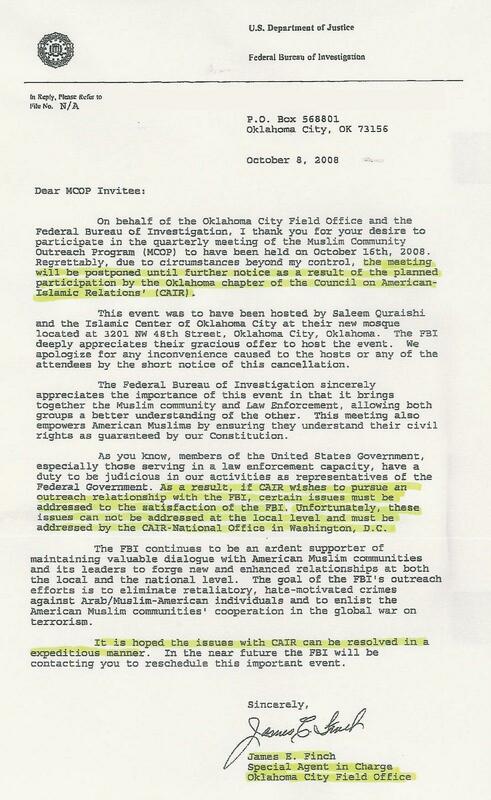 *"CAIR's Status As A Co-Conspirator Is A Matter Of Public Record"
*"CAIR has been identified by the government at trial as a participant in an ongoing and ultimately unlawful conspiracy to support a designated terrorist organization, a conspiracy from which CAIR never withdrew"
*"You did support Hamas in violation of the law,"... "If the Holy Land Foundation did have a face, it was the face of Hamas." *"Until We Can Resolve Whether There Continues To Be A Connection Between CAIR Or It's Executives And HAMAS, The FBI Does Not View CAIR As An Appropriate Liaison Partner..."
*"We Know The Founders Of CAIR Are HAMAS Operatives." *"If CAIR wishes to pursue an outreach relationship with the FBI, certain issues must be addressed to the satisfaction of the FBI. Unfortunately, these issues can not be addressed at the local level and must be addressed by the CAIR-National office in Washington, D.C."